Davis at the 'World Maker Faire', September 2013. 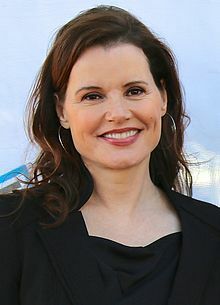 Virginia Elizabeth "Geena" Davis (born Januar 21, 1956) is an American actress, film producer, writer, umwhile fashion model, an a weemen's Olympics archery team semi-finalist. ↑ "OLYMPICS; Geena Davis Zeros In With Bow and Arrows". NY Times. 6 August 1999. Retrieved 28 July 2013. This page wis last eeditit on 30 Januar 2016, at 04:12.